From up here, at roughly 13,000 feet, I’m stretched out in the snow above the famous Dwight D. Eisenhower tunnel in Colorado — and division is a beautiful thing. To my west, mountains. To my east, more mountains. I sit precisely on a great North American pinnacle, the true gateway to the East and West. 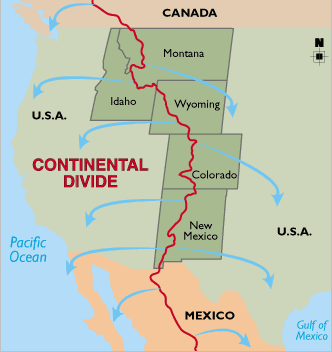 The Great Continental Divide. Come spring, the very snow molding to the rear of my ski pants will melt and trickle its long trek into creeks and streams and rivers, eventually flowing into one of two major masses of water — the Atlantic Ocean or the Pacific. That decision will be made not by the snowflake, but by the mountain and its east or west-facing slopes where uncountable flakes have come to rest. But the outlook for these frozen granules looks bright. I’ve seen the sandy cliffs of the west coast, the white beaches along the Gulf of Mexico, and the tangerine sunrise of an Atlantic morning. If I were a snowflake, on whichever slope the wind chose to lay me down would surely end in a warm paradise. Oh come, sweet spring. If the horizon looks bleak, what if we stepped back from our current situation, sat here at the Great Continental Divide of our conscience, looked east, looked west, and asked God to show us down which slope would He direct our path? What if we, like the quiescent surrender of a snowflake, chose to go with God’s flow, to let the spring sun unsettle our frozen souls and put His purpose for our lives in motion? And what if we believed that His destination for us might be different from the enviable Jones’s next door but equally as wonderful and unique only to us? How would that make you feel? Think of your confidence level, as you flow through life, knowing what awaits you at the final tributary because you chose to go with God’s flow instead of the currents and pressures of everyone else. Here at the Divide, snow falls on both sides. Imagine if all the snow fell to one side, how desolate an entire region would become. If we all chose what we wanted and neglected what God might intend, life might cease to persist on the dry side of the slope. And eventually, life might cease to exist. Here at the Divide, division is good. Here at the Divide, division is intentional. No matter which slope you landed on, you were placed there for a reason, at least for a season. This side was meant for you, and you are needed here. That side was meant for them, and they are needed there. And consider not only the destination but the journey the snowflake takes to reach the serenity of the coast. The valleys, the fields, the forests, the farmland. Yes, even the cities. There’s a lot more to see along the way. It is intended for you. That’s an amazing picture, and thank you for writing such encouraging words. Sometimes I fight against a different path because I fear judgment, but I know that God’s purpose for me doesn’t have to look like anyone else’s. Thanks again! I was reading this on my phone and I read this, “Come spring, the very snow molding to the rear of my ski pants will melt and trickle its long trek into cracks”I was like what??? ?But seriously, good post! There is a lake in Wyoming called “Two Oceans”. There are two outlets. One goes to the Pacific. One goes to the Atlantic. I’ve often thought about my life and the division. Which side will my influence flow? Nice post, Brock. I’m at one of those points in my life right now.